A change is as good as a rest, they say, and now is as good a time as any to change the place where you rest. If you’re stuck for ideas for decorating your bedroom, we have a few suggestions to help you decide on a theme. Nautical themes are perennially popular decorating ideas for the bedroom, whether you choose strong bold colours or natural sandy tones and peaceful sea greens. Sail-white walls will give your bedroom a clean, fresh look and a generous super king size bed will help you drift off to sleep. Accent with bold red and navy cushions on crisp white cotton bed linen or plumb the depths of the sea for inspiration with shades of emerald green. Walk the plank with natural wooden floors and choose billowing voile curtains or wooden blinds as window treatments. Hang prints of peaceful seascapes or stylish black-and-white photographs of shells and sea horses. 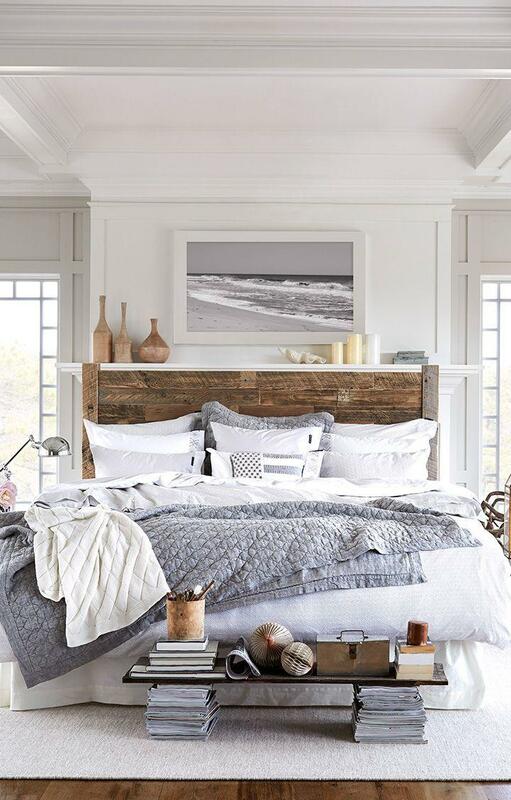 Driftwood mirror frames and lamp bases make the perfect finishing touch. For more coastal inspiration take a look at our Pinboard. Rich colours and exotic fabrics are the foundation of a fabulous Moulin Rouge-inspired boudoir. Layered gold finishes are among the latest wallpaper trends and these go perfectly with bronze antique mirrors and a metal bed with classic black and brass headboard or a fabric bed with faux suede button tufted upholstered headboard. 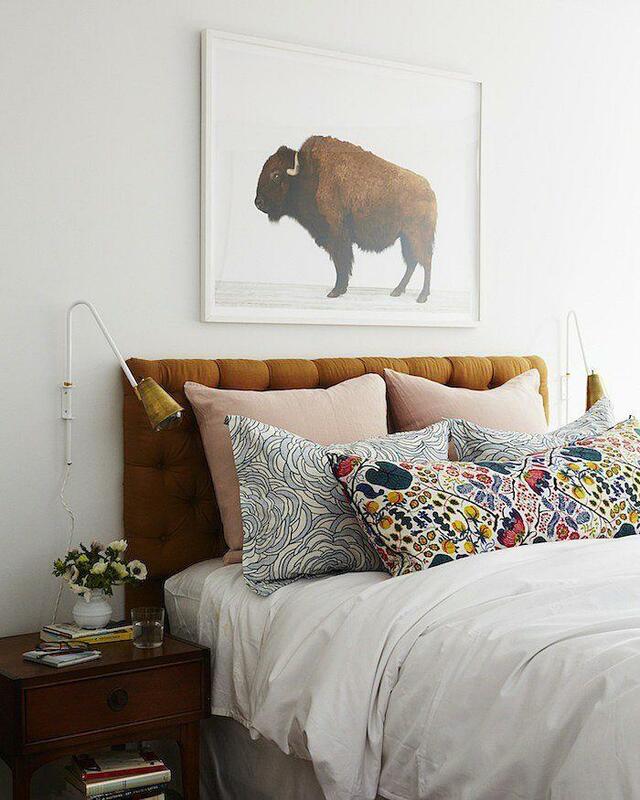 For this bedroom decorating idea, you can go wild with colour and texture, from crushed velvet to sumptuous silk. Rich red and gold swags of fabric will help your bedroom feel like an opulent boudoir, from heavy fringed curtains to bed canopies and faux fur bed throws. Add a dramatic chaise longue and ornate French dressing table to complete the look. For more decadent décor ideas check out our Pinboard. Stylish, contemporary and smart, the boutique hotel bedroom mixes clean whites and neutrals with bold purples, glossy black and colours such as lime green, teal and orange. 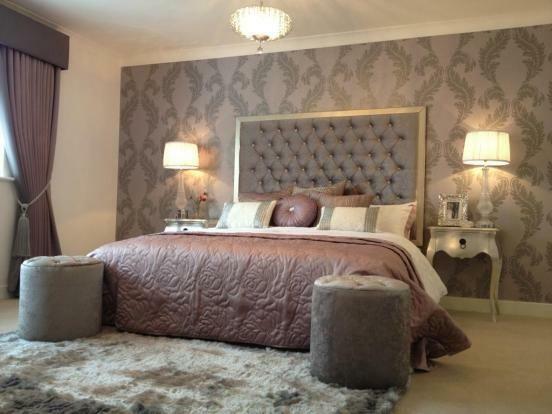 A black or cream leather bed will look perfect in this setting, or choose a contemporary fabric headboard. Create a feature wall behind your double bed with modern patterned or embossed wallpaper and match the accent colours in your choice of bed linen. Solid oak bedside cabinets and a brown or black leather Ottoman at the foot of the bed will both look the part and provide useful storage. Finally, set the mood with framed prints and recessed lighting. Want more inspiration? Have a look at our Pinboard. The 60s and 70s retro look is big business right now and this bedroom décor idea is all about fun accessories, quirky patterns and bold, bright colours. Choose curtain, cushion and bed linen fabrics in red, orange, purple or lime green or stick with 60s chic and go for monochrome designs with the occasional dash of acid colour. When it comes to walls and floors, bold is beautiful for wallpaper and rugs: choose from vibrant swirls, geometric designs or Mondrian-style black lines and colour blocks. 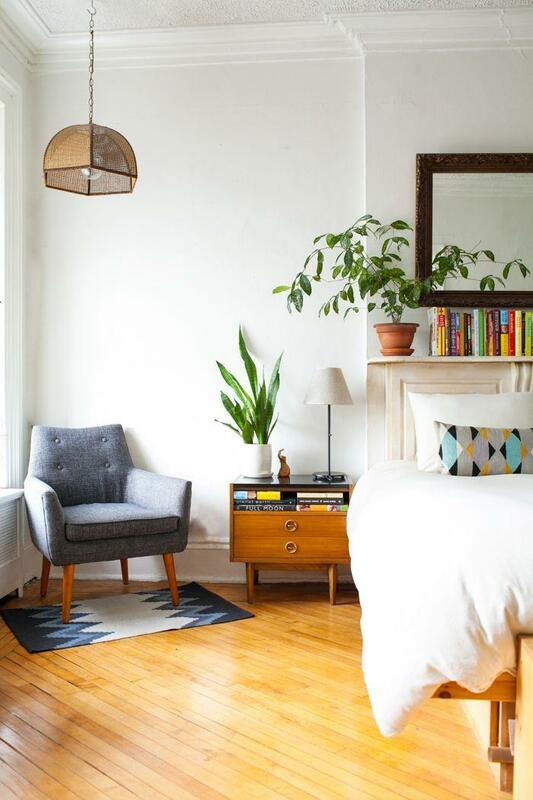 Update the look with a leather TV bed and leather bedside cabinets and complete your retro bedroom with a statement piece of furniture such as an egg chair or a vintage formica dressing table. For more retro inspiration take a look at our Pinboard. Warm reds, oranges and ambers are the dominating colours for this bedroom decorating idea, with the occasional splash of turquoise, indigo or cobalt blue. Walls can be painted earthy hues such as umber or terracotta, with cool tiles and colourful rugs underfoot. A carved wooden screen will add a cosy corner to a large bedroom or partition off dressing areas. Make a statement with a super king-size bed as your centrepiece, either a four-poster or a metal frame bed, then fix voile curtains all around, adding a multi-coloured bedspread and piles of cushions for a touch of Arabian opulence. With brass a leading trend at present, Moroccan lanterns, large wall plates and brass tray tables all provide the perfect finishing touch. 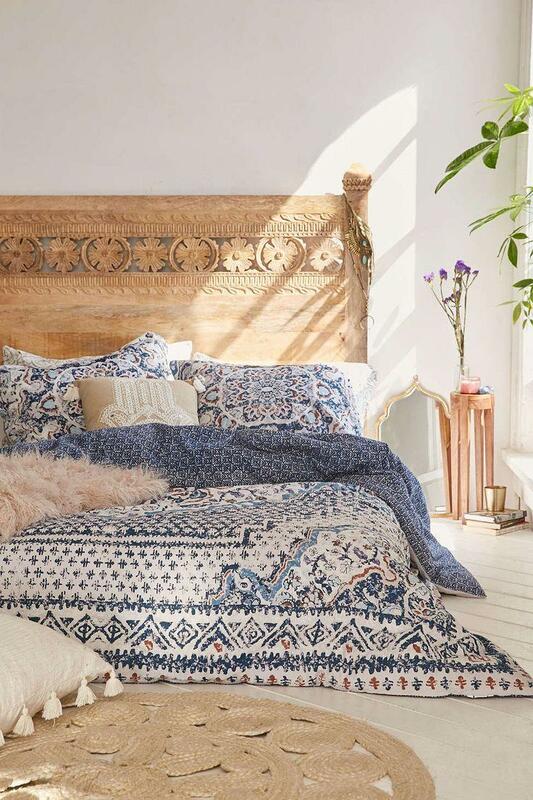 For more great Moroccan style ideas check out our Pinboard.